Nicklas Backstrom, the first line center and alternate captain for the Washington Capitals, is very likely to reach the 1,000 point mark before the end of his NHL career. With the Caps’ most recent 4-2 win against the Calgary Flames, Backstrom now ties Connor McDavid for the most assists in the league with 57. His 78 points is also the fifth highest in the league. For Backstrom, being one of the league’s leaders in points is nothing new — since the 2012-13 season, he’s never once fallen below the top 20. This year in fact may turn out to be Backstrom’s best season in terms of placement in the league. So far in his career, Backstrom has produced 186 goals and 534 assists for a total of 720 career points. He is the Capitals’ all-time leader in assists — a record that he will likely hold well into the foreseeable future. Teammate Alex Ovechkin, who has the second most all-time assists with 477, is not likely to catch up to Backstrom anytime soon. For the Swedish center, who will be turning 30 in November of this year, there is still a long road ahead of him unless he chooses to end his career early. With an average of 71 points per year since his debut with the Caps in 2007, Backstrom has a likely chance of joining the exclusive 1,000 point club if he maintains his performance in the seasons to come. To date, only 86 players have ever reached this milestone, Ovechkin, Henrik Sedin and Sidney Crosby being the most recent ones to do so. As the son of a former professional hockey player, Backstrom’s talent on the ice comes as hardly surprising. Backstrom’s father, Anders, also played for Brynas IF — the same team that Backstrom spent two seasons with before joining the NHL. Backstrom became a first-line center for Brynas IF during the 2005-06 season, his second year with the team. Despite having not recorded a point the season before, he had 10 goals and 16 assists in 46 games to become Rookie of the Year. In 2006, a year after his debut with Brynas IF, Backstrom received his NHL draft in 2006. The Capitals selected him fourth overall, which is to date the fourth highest-drafted Swedish player in league history — only behind Mats Sundin and the Sedin twins. Despite his high draft selection, Backstrom didn’t join Washington until the 2007-08 season, deciding to stay with Brynas for another season. To date, Backstrom is also the youngest player to have played for Team Sweden in an Ice Hockey World Championship tournament. At the age of 18 in 2006, he won a gold medal with the Swedish National Team. Backstrom started his time with Washington as a second line center, but it didn’t take him long to move to the first line. Midway through the 2007-08 season, Michael Nylander — who was first line center at the time — suffered an injury to his rotary cuff. For Backstrom, the move to the first line was a rite of passage that signaled his rise to stardom. 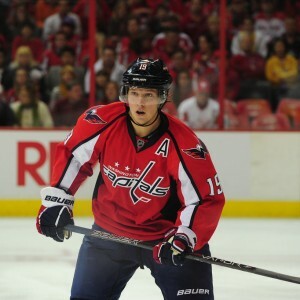 Since his NHL debut in 2007, Backstrom has proven himself a capable playmaker with a knack for enabling scoring plays. Much of it has to do with his ability to maneuver the puck through traffic. He is very capable when it comes to handling the puck and making the right passes to the right individuals. Backstrom also bring a strong element of consistency onto the ice, which helps to explain why he is consistently a points leader in the league. Anytime that he picks up points, Backstrom would often go on lengthy scoring streaks. Back in January, he had a point streak that lasted a total of 10 games, which no other Capital has matched this season. Even during his worst season was in 2010-11, Backstrom still managed 65 points in 77 games. Backstrom’s status as a star isn’t by any means an individual effort. As a playmaker, his ability to pick up points comes in large part through the help of Ovechkin and T. J. Oshie, his wingers. Ovechkin and Oshie are both renowned for being capable scorers in the league, which makes the Backstrom line a deadly terror in the attacking zone. In Washington’s recent game against the Tampa Bay Lightning, Backstrom was able to tally four assists thanks to a hat trick by Oshie. More recently against the Flames, Backstrom had three assists in a game where both his linemates scored. Oshie may be a more recent addition to the Capitals, but Ovechkin has been Backstrom’s teammate since his debut season and that’s been enough to make him a consistent leader in points. 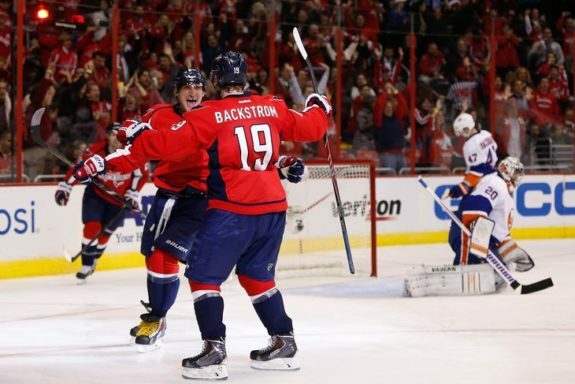 During the 2014-15 season, 33 of Backstrom’s 60 assists were on Ovechkin’s goals. That year, Ovechkin and Backstrom led the league in goals and assists respectively. So long as Backstrom has capable linemates, racking up points is not any difficult task for him. While Backstrom’s future remains to be seen, few can doubt that the Swedish star will hit the four digits at some point in his career just based on his overall performance and the number of years he has remaining.